BICYCLING Magazine recently published a list of the top 50 bike-friendly cities in the United States for 2012. The list was completed based on cities with populations of 95,000 or more (roughly 300 U.S. cities are in this category) based on input from various sources, including the League of American Bicyclists. To make the list, BICYCLING indicates the city must also possess a robust cycling infrastructure and vibrant bike culture. Congratulations goes out to the City of Thousand Oaks for placing 38th on this list! Thousand Oaks was one of only 3 Southern California cities to make the list, which included Los Angeles and Long Beach. The top 10 cities named on the list were: Portland, Oregon, Minneapolis, Boulder, Colorado, Washington, DC, Chicago, Madison, Wisconsin, New York City, San Francisco, Eugene, Oregon and Seattle. BICYCLING noted the 2011 addition of the 1.2 mile Conejo Creek Bike Path and the Conejo Valley Cyclists' recruitment of 300 cyclists for the 2011 Ride of Silence as factors in the City's ranking. 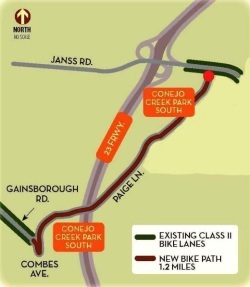 The Conejo Creek Path connects Gainborough Road to Conejo Creek Park, Thousand Oaks Library and Thousand Oaks Teen Center. 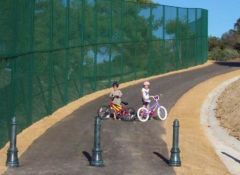 The City of Thousand Oaks maintains approximately 80 miles of bikeways, including about 3 miles of bike paths, roughly 54 miles of bike lanes and other 20 miles or so of bike routes. The City takes bicycling very seriously...the City Council adopted a comprehensive Bicycle Facilities Master Plan in November 2010 to help prioritize future improvement projects around town. Conejo Valley Cyclists is a popular local bicycling club offering beginning to advanced recreational rides as well as race paced training rides. The club organizes the extremely popular annual Cruisin' the Conejo bike ride in the spring of each year. Visit www.cvcbike.org to learn more. Other local cycling clubs/groups in and around Ventura County at THIS LINK. And of course, since its launch in 2006, the Amgen Tour of California is the biggest bike race in the United States. Learn more at www.amgentourofcalifornia.com. In 2011, the final stage of the tour was right here in Thousand Oaks. And finally, check out the City of Thousand Oaks "Bikesafe" website at www.toaks.org/government/depts/public_works/streets/bicycle/home.asp for tips and information to ensure safe bicycling around town.